Everyone knows what Victorinox stands for. Its now-iconic white cross-on-red emblem has been equated with fine craftsmanship, superior understanding of versatility and functionality, and simple yet elegant design aesthetics. While Victorinox is almost always associated with the Swiss Army pocket knife, a cultural icon that is largely emulated but never surpassed, it is also known for making premium-quality wristwatches. For instance, the Victorinox Men’s Original Black Stainless Steel Watch has been dubbed by many as the wristwatch equivalent of the Swiss Army multitool pocket knife. It’s time to take a closer look. The Victorinox 249087 Men’s Original Black Stainless Steel Watch is not really new. In fact, it is the brand’s fitting tribute to its first-ever watch that came out of its watchmaking facilities in 1989, aptly calling the 2019 version to be the brand’s 25th anniversary edition. It retains the original’s easy-to-read, direct, and simple design. 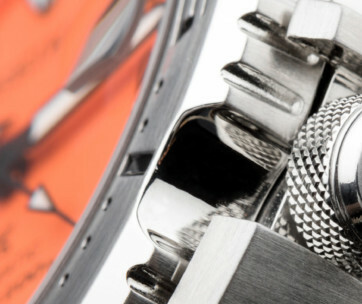 Its solid build remains faithful to the brand’s rigorous quality standards of watchmaking, but without the hefty price tag that is often associated with premium-quality Swiss-made timepieces. Its elegant round face sits conveniently on a 43mm nylon fiber case complete with a screw-in caseback and a black aluminum bezel to give it a faint but otherwise remarkable sparkle when reflecting light. 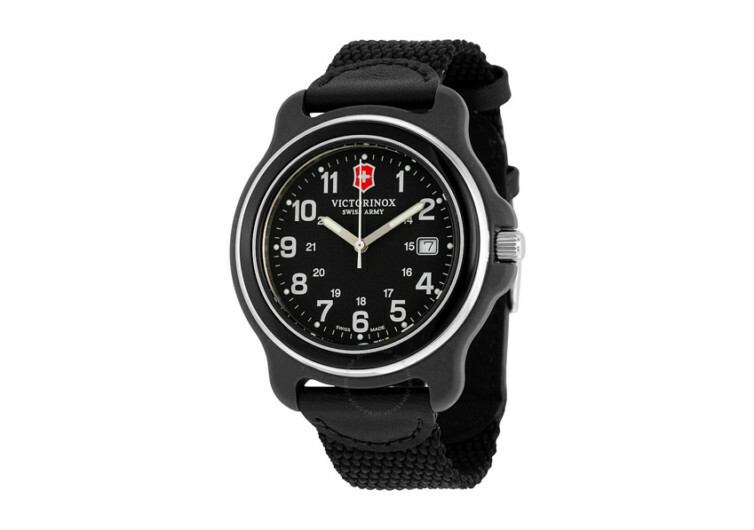 Unlike most luxury Swiss watches that come with mechanical movement, the Victorinox Swiss Army Watch features the Swiss Ronda 515 Quartz movement. This is what moves its three, luminescent analog time hands. It may not be as smooth as an automatic mechanical, but it sure is worth noting that this watch has almost 25 years under its belt. Wrapping the Swiss Army Watch around your wrist is courtesy of a NATO-inspired leather and nylon watch strap complete with heavy-duty buckle closure. The hour and minute markers are designed with full luminosity, providing exceptional contrast to the black dial and allowing for ease of reading time even in the darkest of environments. The usual 12-hour markers come with complementary 24-hour military hour numerals. The iconic emblem of the brand – the white cross on a red coat-of-arms – adorns the 12 o’clock position complete with the brand name underneath. Scratch-resistant hardened mineral crystal covers the dial, giving it an elegant and polished look in the process. 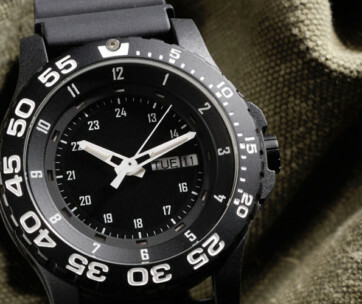 It’s no Rolex, but the Swiss Army Watch has a certain appeal to it that deserves a spot among the world’s best watches. 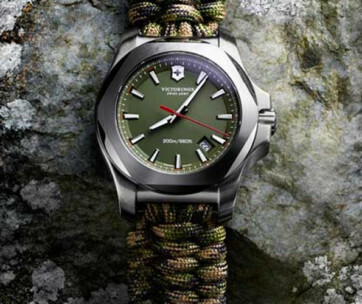 It’s no G-Shock for extreme adventures, but the Victorinox is more than capable of holding its own even in the toughest terrain. True to the brand’s penchant for functionality in a robust design, the Victorinox Swiss Army Watch is a venerable counterpart to the Swiss Army Multitool Pocket Knife used by almost everyone today.